It’s pretty obvious that I love what I do and I love to share with you all even more! I love reading about the history of our hair and the accomplishments we have achieved despite obvious obstacles. Seriously, we are resilient! The hair industry is full of black hair care giants who have laid the foundation to the methods we still use today! I want to share with you two women who completely changed the black hair care industry and entrepreneurship for black women today. Stay tuned because I have something special for you guys! The first woman is someone I did not know about but after reading about her, she deserves a MAJOR SHOUTOUT!!! Annie Turnbo Malone was born in a small town in Illinois in 1867. Annie, like many other women during that time, suffered from severely damaged hair due to illnesses, stress, hygiene, and poor diet. A lot of women dealt with breakage and baldness and confidence was at a low. Annie, who was said to have a background in chemistry, began to mix different ingredients to solve her hair issues. Malone went on to open a successful Poro Beauty College and also salons. Not only did she have a profitable business, her biggest focus was to invest into the African American communities in Saint Louis. She invested into women’s clubs, churches, schools and opened an orphanage. Annie also doubled her manufacturing company as a community center for the black residents in Saint Louis. Many women, black and white followed in her footsteps. One of which we all know very well. Madam C.J. Walker, like Annie Malone, was orphaned at a very young age. She was married at 14 and widowed by the age of 20. She located to Saint Louis from Louisiana with her daughter Lelia and worked as laundress. She too, suffered from breakage and baldness. She wanted to improve her appearance in order to build her self-confidence. Madam C.J. Walker took a step and started to use products that claimed to make her hair grow. As fate would have it, she became a sales agent for Annie Turnbo Malone selling Poro’s Wonderful Hair Grower product. After many attempts, Walker failed to grow her damaged crown. Then in 1905, she had a dream that was the start of her million dollar business. In her dream, she said that God answered her prayers and gave her the ingredients to mix in order to grow her hair. Some ingredients she had to retrieve from Africa in order to make her product complete. After a few weeks of using her product, her hair grew faster than ever! She tested the product on a few friends and was successful with their hair as well. She moved from Saint Louis to Colorado and began door-to-door sales all over the Midwest. She advertised her products in black newspapers and started a mail order business. She relocated the company to Pittsburg and started the Lelia College and expanded to Indianapolis and New York. In 1910, she relocated her headquarters to Indianapolis after her divorce and expanded her product line that included her to seller “Hair Grower,” Glossine, Vegetable Shampoo, Tetter Salve (antidandruff treatment) and Temple Grower. She went on to introduce the “Walker System,” the shampoo-press-and-curl method that has become the foundation of black hair industry and earned her forever a place in Black History. She also donated to many black organizations such as the NAACP, YWCA, Tuskegee Institute and many more. These two women completely changed the black hair industry and many of their methods are still alive and well to this day. This month I want to honor both Annie Turnbo Malone and Madam C.J. Walker by doing a #GROWvember promotion! History has a crazy way of repeating itself and we as black women share the same sentiments of hair growth as these two women. 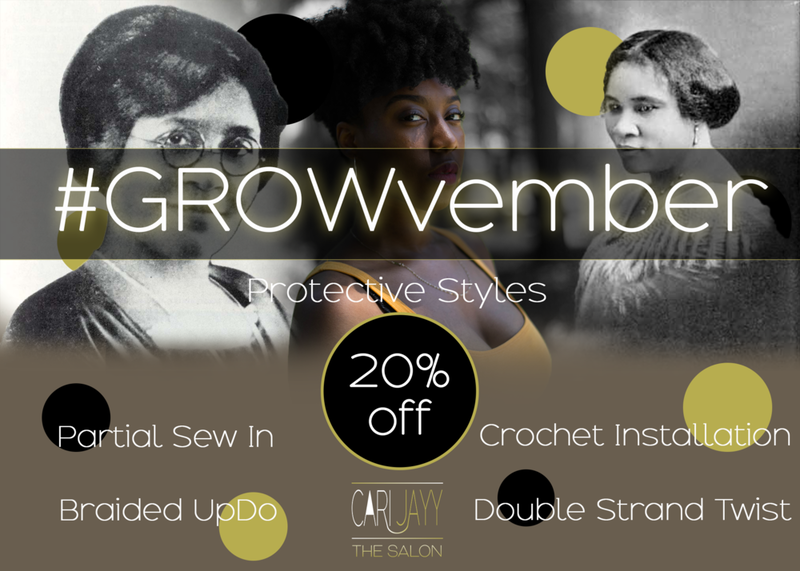 For #GROWvember, I want to give you all a series of services that focus on protective styling and hair care. I am offering protective style bundle deals that will focus on protecting those crowns and get you prepared for the winter months. This promotion will include your choice of treatment and a fly protective style menu you can all benefit from! This will go on for the entire month of November! Lets grow this hair, Ladies! Be sure to tag #GROWvember in your photos on IG, Twitter and Facebook!